Something odd was happening to us. After years of doing two, sometimes three dives easily, it was now a gargantuan effort to even manage a second dive. We felt tired all the time--with "all" being no exaggeration. Finally we figured it must be the hour-and-a-half rigorous exercise we put in each morning before we ever do our turtle stuff. D'oh! So this week, we took a weed whacker to our regimen and limited ourselves to a half-hour cardio jog. This seemed to do the trick. We're still tired--just not exhausted. We also "gained" an hour every day. This week we actually got to play in the pool and act like tourists! 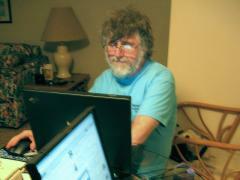 Before we arrived on Maui, we'd vowed to get up at 5 and write for two hours but that simply hasn't happened. Before we arrived on Maui, we'd vowed to get up at 5 and write for two hours. In the two weeks here, we've only managed to write one page! At this rate, it will take us three years to write this book, taking into account that we will have less time back in Canada to work on it than we do here. 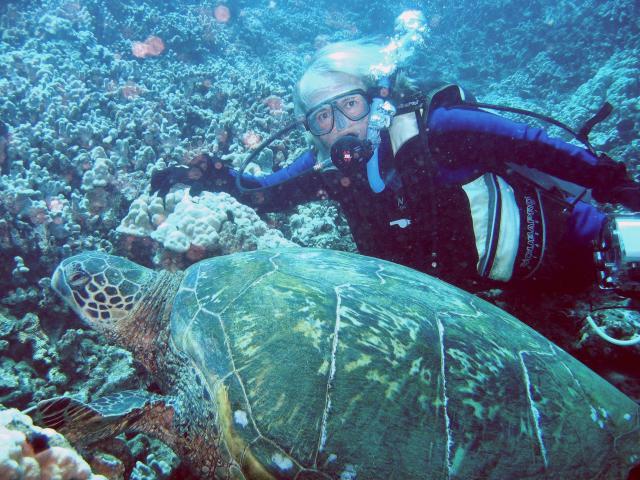 Last summer we reported on the nesting of a famous "Maui Girl"--famous at least if you follow turtle happenings. We'd watched her lay eggs and we even saw her hatchlings erupt from the sand. She was a big part of why Summer 2002 was one of our best ever. George Balazs attached a satellite transmitter to 5690 during her second nesting and then we spent almost a year watching her hug the Napili coastline, which is clearly her Kuleana. George Balazs attached a satellite transmitter to 5690. This summer we vowed to sight 5690 and get her picture. Perhaps this effort is part of the reason we're so tired! 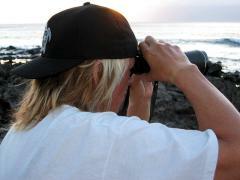 The strategy is simple: go to Napili Bay and try and find her. This involves one of us staying high on a ridge, scanning the water with binoculars and directing the other, who is in the water with camera and snorkeling gear, to any turtles sighted. This involves one of us staying high on a ridge, scanning the water with binoculars. It's worked well, but so far none of the turtles have been 5690. 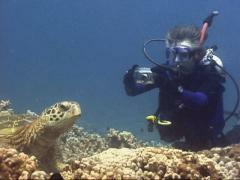 By bizarre circumstance, one of the first Napili turtles sighted turned out to be a male first identified at Honokowai! 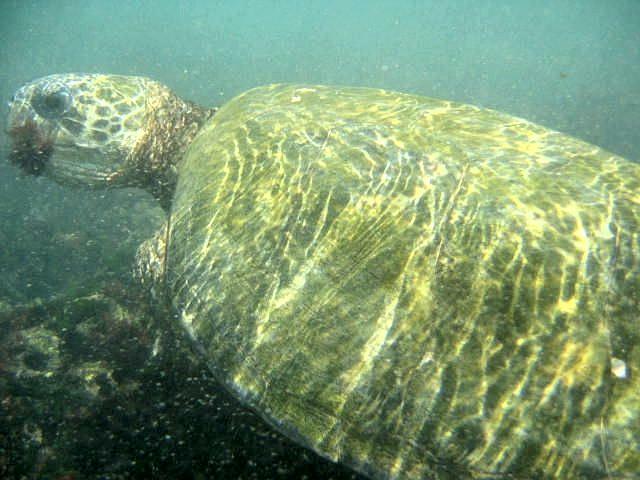 While snorkeling Napili Bay this week, we came upon a rather nonchalant male with a left front flipper missing. He looked familiar. Once back at our computers, we did a quick scan of our database to see if we could match this male's profile with that of a male we sighted a couple of years ago, and who also had a missing left front flipper. If only all turtle identifications were this easy! The first picture below shows this male in Summer 2000 as he's swept about in a strong current. Three years later, we find him merrily munching Pterocladiella just off the Gazebo Restaurant look-out. Nearly swept into Ursula by the current. Munching Pterocladiella just off the Gazebo Restaurant look-out. That's one of the great things about observing sea turtles. They provide you with such wondrous, delightful surprises! 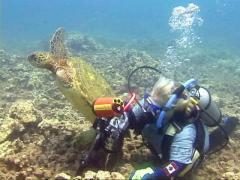 The underwater housing for our new Canon S45 digital still camera arrived and we put it to the test this week. Not only did it keep our camera dry, it functioned much better than we had a right to expect for such a small (and light) housing. Ursula and Uwapo. It ain't the Nikon, but what it lacks in quality it makes up for in ease of use and transport. What this means is in addition to our Nikon SLR camera and Sony digital video camera we can now bring in a third (one that can shoot 65 photos at maximum quality). This means we now have a point-and-shoot, compact, easily maneuverable still camera for documentation purposes. This means we now have a point-and-shoot, compact, easily maneuverable still camera for documentation purposes. We call our Nikon SLR in its IKELITE housing "The Behemoth". Complete with its flash and industrial strength housing, it's heavy and a tough slog in strong currents, but it guarantees quality images that the Canon digital camera can only dream about. For publication quality (magazine covers, full-page spreads) it's the photographic vehicle that delivers. Thus we end this summary with our favourite photograph of the week, courtesy of The Behemoth. Tutu, eyes fixed on a landing spot, flies over 605C. 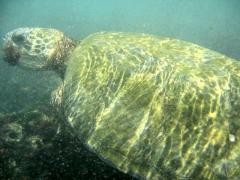 These are both adult tagged female honu. 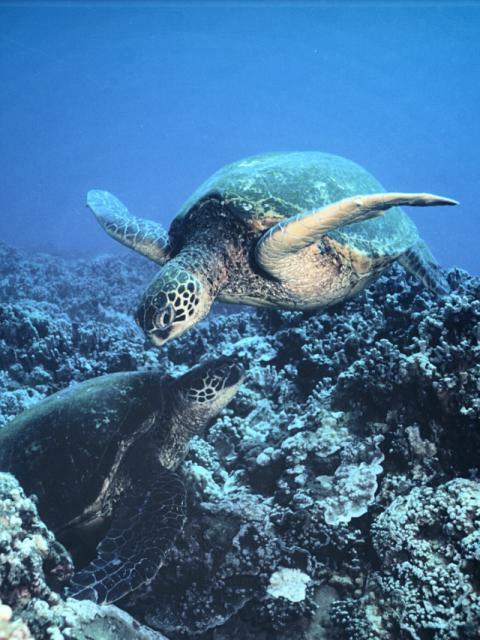 Both were confirmed nesting last summer at East Island, French Frigate Shoals. Summer 2003 finds them home in their Kuleana. Tutu, eyes fixed on a landing spot, flies over 605C. Tutu has lived at Honokowai since 1990 and is an old friend. If honu had queens, Tutu would be monarch here. She's royalty. 605C has her own special story. Two summers ago, she was selected as a research turtle and carried a time/depth recorder (TDR) for an ongoing project. The last week of August of that year found us desperately trying to retrieve the TDR. But even with three dives a day we could not locate 605C when it really counted. We headed home with a mission incomplete. 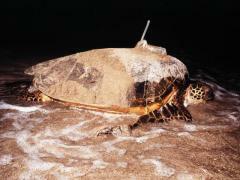 Next we heard of 605C was June 2002 when George Balazs confirmed she was nesting at East Island--without her TDR! George is eager to attach more TDRs to this summer's crop of Honokowai honu--but will take a huge act of faith for George to select 605C again!